A vast improvement over last week’s outing of Supernatural. This episode drilled into some of the strongest aspects of the show to deliver a strong and satisfying story. Turns out Dean has turned his attentions to the world of online dating, or more accurately online hooking up. This causes him to stumble onto a brothel run by a witch to steal souls. It’s slightly refreshing to see the brothers happen upon a case rather than actively seeking one out, it’s not something that happens very often so it’s good to know that random stuff does happen. Though it is hilarious that a woman Dean happens to arrange to hook up with happens to be involved in a Supernatural situation. 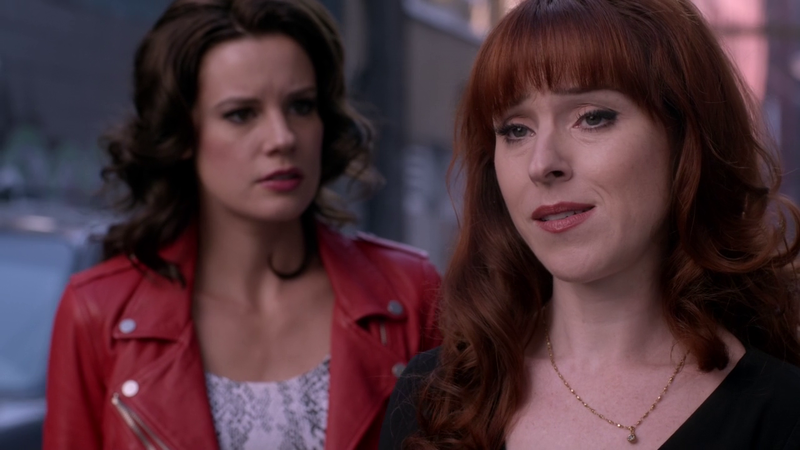 This allowed the central threat, Rowena (Ruth Connell) to enter the plot naturally and present herself as an effective threat to the Winchesters and even to Crowley. Having her revealed as Crowley’s mother should present an interestingly different angle on this character. I like to see Crowley squirm and being faced with his mother should make him squirm like nothing else has. I dare say there’ll be lots of old resentments redressed with modern sensibilities just like when his son appeared. I look forward to them playing with this as Mark Sheppard is great at this sort of material and it seems like Ruth Connell will be a good match given her insanely tongue in cheek performance here. I liked Rowena in general despite the fact that she was so cartoonishly evil. Maybe the Scottish accent made that a little more believable or that I’m just biased when it comes to actors from my home town. Seriously, Ruth Connell was born in Falkirk and that’s awesome. She spent much of her time corrupting two easily corruptible prostitutes and injecting this interaction with lots of charisma. She’ll be a good villainous presence for the show so I look forward to seeing more of her. Crowley’s story was furthered slightly here as well. We basically got little more than a reminder that he’s losing his grip on hell and his underlings. I can see why this has been done given that he’s been missing for the past 3 episodes so a reminder of what he’s up to was needed. There wasn’t much in the way of progression of this story as such but these scenes were good enough. I liked the Castiel and Hannah plot which has felt like it’s been languishing before now. It’s something I found that I didn’t miss when it had been left out of the 3 episodes prior to this. Finally seeing some progression on this was great and these scenes definitely belonged to Hannah. The idea that she’s starting to empathise with the human condition was a really strong one and using her vessel’s husband to enhance this idea was a really good choice. It’s interesting that Hannah has gotten to grips with humanity on a deeper level than Castiel has and has been infected -for want of a better word- with compassion and regret over essentially robbing her vessel of her life. It was a noble way for the character to make an exit and sort of redeems her earlier questionable actions. If this gets Castiel back with the Winchesters then all the better. Side note, it’s refreshing to see someone perform an internet search for a name and have different options turn up rather than only the one that is looked for. Nice piece of subtle realism there. This episode sees the return of Cole and it feels like just about enough time since we last saw him. It’s believable that it would take him this long to catch up with the Dean and get his head around this world of Demons. 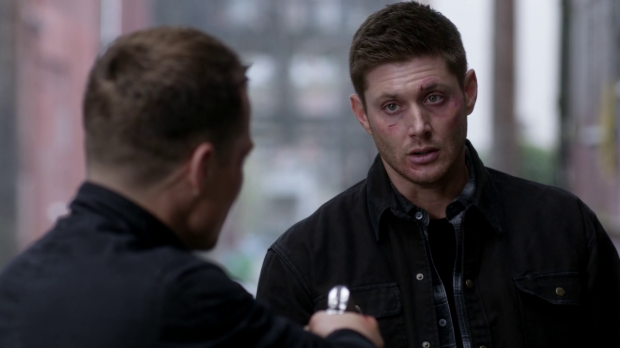 His confrontation with Dean was really nicely done with great acting from Jensen Ackles and Travis Aaron Wade. Wade’s performance evoked so much pain and internal conflict and made him a nicely sympathetic character. Dean handled the situation really maturely which helped make it seem all the more sincere. I’m sure the references to the creature that Cole’s father had become being seen only on that night is some kind of foreshadowing so we shall see where this goes. Unfortunately the multiple story threads in this episode meant that the pacing was all over the place. Nothing in here was especially bad but everything thrown in at once made the episode feel a little too bloated. I feel like the Castiel and Hannah story could have offset the Cluedo nonsense last week and let more room for the other plots to breathe this week. I’m also confused as to why the brothers aren’t talking about the Mark of Cain when it’s a big problem that is literally following them around. Another thing that puzzles me is the indiscriminate killing of Demons rather than the standard exorcism that they would try in the past. I get why Dean wouldn’t be bothered about that but it should be something that Sam deems very important. I dare say this won’t be brought up again but it stuck out to me. A vast improvement on the previous episode in almost every way. The show is definitely still capable of playing to its many strengths. The idea of Dean stumbling into a case through trying to hook up with women is a hilarious notion as it reeks of some really bad luck as well as being just “so Dean”. It allowed the main villain, Rowena to enter the plot fairly naturally and establish herself as a formidable presence within the narrative. Her ties to Crowley should prove to be an interesting story for the writers to play with. Cole’s return was well done here with some really powerful character moments concerning both him and Dean. Cole is an interesting character that will hopefully become a more permanent fixture around here as the show is in dire need of some new blood to make things interesting. I was surprised by how on board with the Castiel and Hannah story I was this week. Seeing Hannah gain a clear understanding of what it means to be human and recognise that she causes lots of harm by simply being around is a really interesting story that creates an interesting contrast between her and Castiel. Castiel doesn’t quite understand humanity the way she does and is far more detached so this created some great moments. The packed nature of this episode meant that the pacing was all over the place. Some of the plots fed into each other but in general it felt like more of a collection of scenes awkwardly put together rather than a cohesive story. Those scenes were at times great but plot saturation was an issue here.